Lily Indenbaum is a year 7 Challenge Detroit fellow working in the Human Resources department of Goodwill Industries of Greater Detroit. Lily Graduated from the University of Michigan with a Bachelor of Arts degree and a major in Psychology. 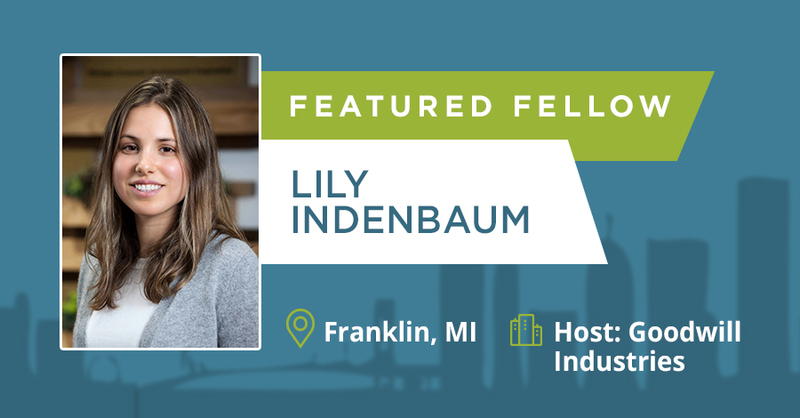 Lily is passionate about her work in Detroit and hopes to highlight the hard work the Challenge Detroit fellows engage in, as well as the non-profits working relentlessly for the Detroit Community. “helping with orientation, reviewing the policies that are currently in place, helping labor negotiations and working with unemployment claims. “As I was challenging my third-grade students to complete their homework, I thought “how could I challenge myself more in Detroit?” I was conflicted between spending another year in service to help Detroit, and wanting to explore more employment options. Challenge Detroit fit both of these desires. Through Challenge Detroit, I have helped Detroit Non-profits and have spent time working in a company that is doing incredible things for Detroiters. We just finished our third challenge project working with Century Forward in the Fitzgerald neighborhood. As a team member on the goods and services team, I focused on what community members wanted to see around their neighborhood and, as a team, we came up with a concept and programming for a community center, which multiple community members voiced as their main concern. I hope that, through my work and with the dedication of my fellow co-fellows, we will help to make the mission of the non-profits and companies we work with possible, and take some of the work off of the non-profit employees’ loaded shoulders. Check out the video to see some of the things she and her co-fellows have been up to this year! For over 95 years, Goodwill Industries of Greater Detroit has been a leader in making a difference in people’s lives. We help them find work, hope and pride in their life and in their career. Goodwill delivers services based on the needs of those we serve. We work with businesses, non-profits and government agencies in Metro Detroit to make this happen. Our work would not be possible without our community partnerships. Each day, we impact lives throughout the Wayne, Oakland, Macomb and Washtenaw Counties.